If you're enrolled in the 4-H Western Heritage Project in your state, this section of the website will assist you in completing the Youth Activity Guide. As a first step, obtain a 3-ring binder notebook, print the 4-H Western Heritage Project rules below, and place them in the front of your binder. Next, to record your scores, print a few copies of the score sheets for both timed and non-timed shooting. Place these in your notebook as well. Keep track of your scores as you practice and compete and watch your skill level improve. You can always revisit the website and print more score sheets. Also look over the clothing evaluation sheet to prepare for judged interviews and use the Building a Presentation Board resource to make better displays. Then feel free to tackle the digital matching games found on each Level page and record the answers in your book. You can navigate to each Level page by clicking on the buttons at the bottom of this page. To assist you in organizing your activities, further instructions, tables, and forms are available to print on the Activity Supplement pages. These are also arranged by Level and then organized in the order they appear in your Youth Activity Guide. Many activities can be conducted in groups while others are best done on your own. All count toward your progress as you meet the requirements to travel from the distinction of Pilgrim to Marshal. 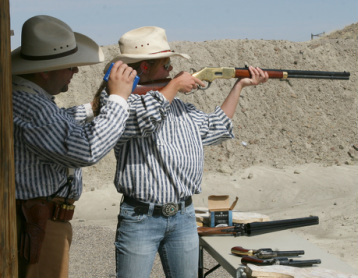 Download and print the youth version of the 4-H Western Action Shooting Rules below and place them in your project notebook. Become familiar with the rules and discuss any questions you may have with your 4-H leader. Download and print the score sheets below and keep track of your improvements even if your practices are not being timed. Use the Clothing Assessment Sheet to prepare for judged clothing interviews.